6. OFFICE CHAIR: Because of vast differences between people’s height, weight, body type, and preference, it’s difficult—if not impossible—to find a one-size-fits-all solution when it comes to office chairs! In the ideal world, the option to sit, stand, walk, and stretch as needed would be perfect but this simply is not reality! Low back pain (LBP) from sitting is common due to the excess pressure it places on the joints and disks (the “shock-absorbers” of the spine). Here are some remedies: 1) Find a chair that FITS YOU. 2) Get up and move at least once every hour (set the timer on your smartphone as a reminder). 3) Place the computer monitor directly in front of you and keyboard/mouse so the elbows bend only 90°. 4) Keep your feet on the floor at your desk (use an upside down box if you have short legs). 5) Perform “in the chair” stretches when your timer goes off! 7. BODY TYPE: We’ve discussed obesity as an obvious cause of back pain, but other factors are important as well. A very common cause of back pain for women is breast size. Here, the topic of a supportive bra is important, as carrying more weight in front of you adds additional stress on the back and shoulders. 8. SHOULDER BAGS: Back pain can be caused and/or perpetuated by a heavy purse, bag, briefcase, and even a thick wallet in the back pocket! To keep your eyes level, your body has to compensate and assume a less-than-ideal posture that may place unnecessary stress on your back! So before leaving the house today, CLEAN OUT that bag and/or put your wallet in a front pocket and lessen the load on your spine! 9. SMOKING: Smoking can reduce the amount of oxygen that reaches your cells, which can cause them to function at a less than optimal state. You’ve perhaps heard that a conscientious back surgeon will NEVER operate on a smokers’ back due to both the prolonged healing time and subsequent bad outcomes. So in addition to giving your heart, lungs, and those around you a break, if you want your lower back to heal, STOP SMOKING! Studies also show smokers are TWICE as likely to develop LBP compared with non-smokers, so quit. Better yet, DON’T START in the first place! 10. STRESS & DEPRESSION: Remember, “health” is a balance between structure, chemistry, and mental factors. Stress increases muscle tightness and alters posture in a way that can lead to or exacerbate existing LBP. Exercise, meditate, eat smart, and resolve your differences with family members and friends to minimize this problem! When needed, your doctor of chiropractic can refer you for counseling! 11. ERGONOMICS: How we “fit” into our job, lifting properly, workstation set up, work pace, and work stressors ALL play into LBP management. Have an assessment to see what can be fixed! MATTRESS: Which type of mattress is best? The “short answer”: there is no single mattress (style or type) for all people, primarily due to body type, size, gender, and what “feels good.” TRY laying on a variety of mattresses (for several minutes on your back and sides) and check out the difference between coiled, inner springs, foam (of different densities), air, waterbeds, etc. The thickness of a mattress can vary from 7 to 18 inches (~17-45 cm) deep. Avoid mattresses that feel like you’re sleeping in a hammock! A “good” mattress should maintain your natural spinal curves when lying on your sides or back (avoid stomach sleeping in most cases). Try placing a pillow between the knees and “hug” a pillow when side sleeping, as it can act like a “kick stand” and prevent you from rolling onto your stomach. If your budget is tight, you can “cheat” by placing a piece of plywood between the mattress and box spring as a short-term fix. SHOES: Look at the bottom of your favorite pair of shoes and check out the “wear pattern.” If you have worn out soles or heels, you are way overdue for a new pair or a “re-sole” by your local shoe cobbler! If you work on your feet, then it’s even more important for both managing and preventing LBP! DIET: A poor diet leads to obesity, which is a MAJOR cause of LBP. Consider the Paleo or Mediterranean Diet and STAY AWAY from fast food! Identify the two or three “food abuses” you have embraced and eliminate them – things with empty calories like soda, ice cream, chips… you get the picture! Keeping your BMI (Body Mass Index) between 20 and 25 is the goal! Positive “side-effects” include increased longevity, better overall health, and an improved quality of life! EXERCISE: The most effective self-help approach to LBP management is exercise. Studies show those who exercise regularly hurt less, see doctors less, have a higher quality of life, and just feel better! This dovetails with diet in keeping your weight in check as well. Think of hamstring stretches and core strengthening as important LBP managers – USE PROPER TECHNIQUE AND FORM; YOUR DOCTOR OF CHIROPRACTIC CAN GUIDE YOU IN THIS PROCESS! POSTURE: Another important “self-help” trick of the trade is to avoid sitting slumped over with an extreme forward head carriage positions. Remember that every inch your head pokes forwards places an additional ten pounds (~4.5 kg) of load on your upper back muscles to keep your head upright, and sitting slumped increases the load on your entire back! As stated last month, exercises that focus on improving posture, flexibility, strength, and coordination are important for creating a well-rounded cervical rehabilitation program. Our discussion continues this month with stretching and strengthening exercises. STRETCHING: Since our neck muscles have to hold up our 12 pound (~5.5 kg) head, it’s no wonder why our neck muscles seem to be tight almost all the time. Here are two ways to stretch the neck: 1) You can simply drop the chin to the chest, look at the ceiling, try to touch your ear to your shoulder (without shoulder shrugging) on both sides, and rotate the head left to right and vice versa (six directions). 2) You can use gentle pressure with your hand and assist in the active stretch by gently pulling into the six directions described in #1 by applying “over-pressure” at the end-range of motion (staying within “reasonable pain boundaries”). STRENGTHENING: Most people have a forward head carriage, meaning their head normally rests in front of their shoulders. The further forward the head sits, the greater the load on the muscles in the back of the neck and upper back to hold it up. This position promotes a negative spiral or “vicious cycle” that can lead to many complaints including (but not limited to) neck pain, headaches, balance disturbances, and in the long-term, osteoarthritis. There are two important groups of muscles that require strengthening: the deep neck flexors and deep neck extensors. 1) The deep neck flexors are muscles located directly on the front of the cervical spine and are described as being “involuntary” or unable to be voluntarily contracted. Hence, we have to “trick” the voluntary outer “extrinsic” (stronger) muscles into NOT WORKING so the deep, intrinsic ones will contract. You can do this by flexing your chin to the chest and pushing your neck (not head) back over your shoulders into resistance caused a towel wrapped around the back of the neck. If you feel your chin raise towards the ceiling, you’re doing it WRONG! Keep the chin tucked as close to the chest as possible as you push your neck (not your head) backwards. If you’re doing it correctly, your chest should raise towards the ceiling as you push your chin down and neck back. Try it! 2) The deep neck extensors are strengthened in a very similar way EXCEPT here you DO push the back of HEAD back into your towel while keeping your chin tucked tightly into your chest. Do three reps, holding each for three to five seconds and switch between the two for two to three sets. We will finish this discussion next month with important coordination exercises! Neck pain can occur for many different reasons, but what can you do about it? That’s the BIG question! As discussed last month, exercise training is an important part of the chiropractic management process. Let’s take a close look at which exercises are MOST important with respect to self-management strategies. There are several goals or reasons to perform neck exercises. We will break these down into four main categories: Posture, stretch, strengthening, and coordination. POSTURE: The biggest culprit in this category is the forward head carriage. If you look around a crowded airport, bus stop, train station, or mall, you can see MANY examples of this. If fact, this faulty posture is estimated to occur in 66-90% of the population! Also, forward head posture is STRONGLY associated with decreased respiratory muscle strength, which can reduce lung capacity and our ability to breath by as much as 30%! It’s also linked to tension headaches, altered eye and ear function, high blood pressure, and over time it can lead to arthritis, herniated disks, pinched nerves, and more. The “classic” appearance is the position of the head is too far forward, the shoulders roll forwards and the upper back sticks out. Did you know that for every inch the head glides forwards from the proper position, there is a 10 lbs (~4.5 kg) increase of weight that the neck and upper back muscles have to hold up? Using an average 12 lbs (~5.4 kg) head, a 5 inch (~12.7 cm) forward head carriage places an extra 50 lbs (~23 kg) of weight on the upper back/neck muscles for a 62 lbs (~28 kg) total! So, LET’S FIX IT! Here is one exercise that may help your posture: Look straight ahead and 1) Tighten your core by performing an abdominal brace. This is done by contracting your belly muscles so that when you poke your thumbs into your sides and front, you feel a firm abdominal muscle wall. You don’t have to “brace” at a 100% of maximum, shoot for 25-50% or just enough to feel the muscles contract. Relax and contract several times so you’re sure you can feel the muscles tighten up. Keep a curve in your lower back when you do this (don’t slouch). 2) Lift your chest – don’t just tuck you head back! This will improve the rounded shoulders and slouched upper back posture. Think of lifting your chest towards the ceiling more than just sticking it out. Notice in a mirror how much improvement occurs already! 3) Perform chin retractions – do 10 retractions every hour (set the timer on your cell phone to remind you)! Do this gently, slowly, and to a firm end-point of movement. If you feel like you are creating a “double or triple chin,” you are doing it right! If you do the ten reps every hour, then in an eight hour work day, you’ll have done 80 posture corrections! This a GREAT way to “re-program” your nervous system and when you find yourself doing this WITHOUT THINKING, it will have become a new (and good) habit! Stay tuned next several months for more neck exercises focused on STRETCH, STRENGTHEN, and COORDINATION training! The term sciatica describes the symptoms of leg pain and possibly tingling, numbness or weakness that originates in the lower back and travels through the buttock and down the large sciatic nerve in the back of the leg. Sciatica (pronounced sigh‐at‐ih‐kah) is not a medical diagnosis in and of itself ‐ it is a symptom of an underlying medical condition. Sciatic pain can vary from infrequent and irritating to constant and incapacitating. Specific sciatica symptoms also vary widely in type,location and severity, depending upon the condition causing the sciatica. While symptoms can be very painful, it is rare that permanent sciatic nerve damage (tissue damage) will result. The sciatic nerve is the largest single nerve in the body and is composed of individual nerve roots that start by branching out from the spine in the lower back and combine to form the “sciatic nerve.” When it is irritated, sciatica symptoms occur. At each level of the lower spine a nerve root exits from the inside of the spine and then comes together to make up the large sciatic nerve. The sciatic nerve runs from the lower back, down the back of each leg. Portions of the sciatic nerve then branch out in each leg to innervate certain parts of the leg – e.g. the buttock, thigh, calf, foot, toes. The sciatica symptoms (e.g., leg pain, numbness, tingling, weakness, possibly symptoms that radiate into the foot) are different depending on where the nerve is pinched. For example, a lumbar segment 5 (L5) nerve impingement can cause weakness in extension of the big toe and potentially in the ankle. The incidence of sciatica increases in middle age. Rarely occurring before age 20, the probability of experiencing sciatic pain peaks in the 50s and then declines. Often, a particular event or injury does not cause sciatica, but rather it tends to develop over time. The vast majority of people who experience sciatica get better within a few weeks or months and find pain relief with non-surgical sciatica treatment. For others, however, sciatica pain from a pinched nerve can be severe and debilitating. There are a few symptoms that may require immediate medical, and possibly surgical, intervention, such as progressive neurological symptoms (e.g. leg weakness) and/or bowel or bladder dysfunction (Cauda Equina Syndrome). Because sciatica is caused by an underlying medical condition, treatment is focused on relieving the underlying causes of symptoms. Treatment is usually self-care and/or non-surgical, but for severe or intractable cases surgery may be an option. Lumbar herniated disc (also referred to as a slipped, ruptured, bulging, or protruding disc, or a pinched nerve) occurs when the soft inner core of the disc leaks out through the outer core and irritates the nerve root. Sciatica is the most common symptom of a lumbar herniated disc. Degenerative disc disease is diagnosed when a weakened disc results in excessive micro-motion at that spinal level, and inflammatory proteins from inside the disc become exposed and irritate the area (including the nerve roots). Isthmic spondylolisthesis. 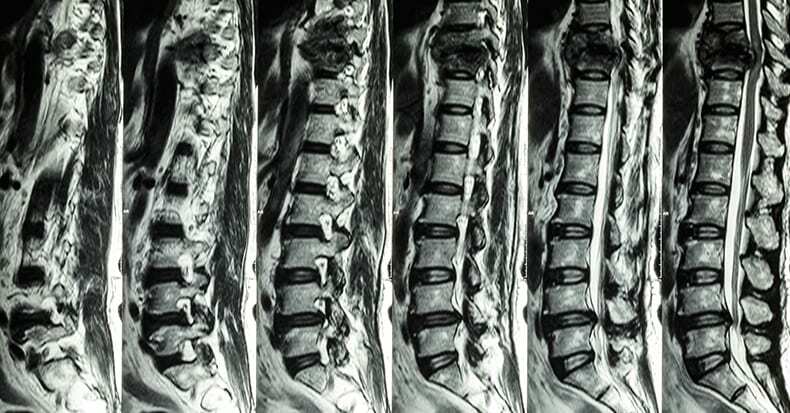 This condition occurs when a small stress fracture allows one vertebral body to slip forward on another (e.g. the L5 vertebra slips over the S1 vertebra). The combination of disc space collapse, the fracture, and the vertebral body slipping forward, can cause the nerve to get pinched and cause sciatica. Lumbar spinal stenosis is related to natural aging in the spine and is relatively common in adults over age 60. The condition typically results from a combination of one or more of the following: enlarged facet joints, overgrowth of soft tissue, and a bulging disc placing pressure on the nerve roots, causing sciatica pain. Piriformis syndrome. The sciatic nerve can get irritated as it runs under the piriformis muscle in the buttock. If the piriformis muscle irritates or pinches a nerve root that comprises the sciatic nerve, it can cause sciatica type pain. Sacroiliac joint dysfunction. Irritation of the sacroiliac joint – located at the bottom of the spine – can also irritate the L5 nerve, which lies on top of the sacroiliac joint, causing sciatica type pain.